The forthcoming Criterion Collection Blu-ray/DVD release of Michael Cimino’s Heaven’s Gate (1980/81) has, predictably, prompted a fair amount of revisionism. Once a film that Vincent Canby claimed was nothing less than “an unqualified disaster,” now at least one website hails it as a “masterpiece.” A recent screening of the restored (original) version of the film at the Venice Film Festival received a standing ovation. Strangely, like many of the “New” Hollywood films released during the late 1960s and early 1970s, the film has conspicuously polarized its viewing audience, eliciting strong responses from both sides, revealing that the issue is not really about the film itself, but about the film and its audience. Once reviled, now celebrated, the film’s curious afterlife should remind us of an insight offered by the great cynic Diogenes, who, legend has it, asked to be buried standing on his head, because, so he thought, one day down would be up, and up would be down. Touted on the Criterion Collection website as a film that is “among Hollywood’s most ambitious and unorthodox epics,” I think Dennis Lim, writing in the New York Times, offers a more accurate insight into the film absent the promotional spin: Heaven’s Gate “plays more than ever like a fittingly bleak apotheosis of the New Hollywood, an eccentric yet elegiac rethinking of the myths of the West and the western, with an uncommonly blunt take on class in America. . . .” Mr. Lim goes on to say that by the time Heaven’s Gate was released, late in 1980, it was an anachronism, in large part explaining its failure. While the popular and critical success of The Deer Hunter demonstrated that Michael Cimino had been able to address historical events by employing a traditional, Classic Hollywood form (The Best Years of Our Lives set in the post-Vietnam era), Heaven’s Gate was far more radical, having a counterculture sensibility that more properly belonged to what Robert B. Ray calls the “Left and Right cycle” of the late 60s and early 70s (A Certain Tendency of the Hollywood Cinema, 1930-1980, p. 296 and following.) Many of the comments that follow are extrapolated from arguments made in his excellent book. As Steven Bach pointed out in Final Cut (1985), his best-selling account of the production of the film, Heaven’s Gate was originally titled The Johnson County War and was based on a script that Cimino had written several years earlier, perhaps around 1971 or 1972, in other words, at the height of the Left and Right cycle that characterized the so-called “New” Hollywood of the period. Ray observes that following the 1967 success of The Graduate and Bonnie and Clyde, “the industry followed with a series of movies intended to appeal to the counterculture’s most visible elements. Nixon’s election, and the surprising popularity of the old-fashioned Airport (1970), however, demonstrated the existence of a large conservative audience and set off a wave of right-wing films” (298). In addition to The Graduate and Bonnie and Clyde, other Left films included Cool Hand Luke (1967), Easy Rider (1969), Butch Cassidy and the Sundance Kid (1969), Little Big Man (1970), and McCabe and Mrs. Miller (1971). Among the Right films are Coogan’s Bluff (1968), Dirty Harry (1971), Walking Tall (1973), and Death Wish (1974). What this list of Left and Right films had in common was the motif of the frontier and its ideological value in American life. “Politically,” Ray writes, “the willingness to concede the frontier’s closing became the bedrock issue dividing the Left and Right” (301). The Johnson County War/Heaven’s Gate was created during this period. Obviously, the explicit treatment of this theme was in the Western, and the Left movies of this period rather uniformly concluded that the American frontier had closed. So, too, does Heaven’s Gate, except it did so long after the Left and Right cycle had come to a close, supporting Dennis Lim’s argument that the film’s failure was due in large part to being released too late, after the political divisiveness of the 1960s had subsided. Moreover, Heaven’s Gate was released after what Robert Ray calls “corrected” genre pictures such as The Godfather (1972) and Taxi Driver (1976), two films premised on an ideological ambivalence, meaning they could be read two ways, appealing to both Left and Right. (Actually, the first film I remember working this way was Patton , which had adherents on both sides of the ideological divide cheering: Patton as psychopath, Patton as hero. Think Travis Bickle.) Essentially, these “corrected” genre pictures had brought the Left and Right cycle to a close, years before the release of Heaven’s Gate. Given that Criterion has chosen to champion Heaven’s Gate thirty-two years after its initial release, it’s now possible to see the film for what it was originally intended to be, a film made for what Robert Ray calls “ironic filmgoers,” film buffs who are “bored with conventional movies” and who champion “art films and revisionist reworkings of Classic Hollywood formulas,” precisely the sort of filmgoer for which Criterion was established. Certainly, this sort of viewer has steadily grown since the early 1980s, but one must remember that the sort of films that set out to frustrate viewer expectations promoted by their genres almost always fail at the box office. As Ray points out, none of the seventies movies now greatly admired by ironic filmgoers, films such as Badlands, New York, New York, The Conversation, Mean Streets, and Nashville, made the Top Twenty lists. As Ray observes, these films’ “lack of success reconfirmed the audience’s fundamental conservatism” (328). For the film’s thematic adherence to the films of the Left and Right cycle, a few examples will suffice. The Villains. Left movies of the late 60s and early 70s period typically had villains whose cold impersonality, according to Ray, “seemed to stand for an historical process” (303). Outside of the head of the Wyoming Stock Growers Association, Frank Canton, Heaven’s Gate’s villains, an army of thugs, is largely anonymous and impersonal, a mass. The Wyoming Stock Growers Association functions rather like the mysterious “Corporation” of McCabe and Mrs. Miller, representing the inexorable advance of modernity. The icy cold and imperturbable “Man with No Eyes” of Cool Hand Luke is an another obvious example of the impersonality Ray is talking about, but so, too, is the line from 1969’s Butch Cassidy and the Sundance Kid, “Who are those guys?,” referring to the Pinkerton men pursuing the outlaw heroes. (Pinkerton men as avatars of the closing of the frontier also appeared in Philip Kaufman’s 1972 Left film, The Great Northfield Minnesota Raid.) Indeed, the question, “Who are those guys?,” caught on in the counterculture, and is a line that Ray avers “summed up the Left’s anxiety about the Europeanizing of America” (303). The “Europeanizing of America” is what Heaven’s Gate is all about. The Setting. Although set in frontier Wyoming, Cimino’s West is Breughelian, already crowded and claustrophobic, suggesting the closing of the frontier is all but over. 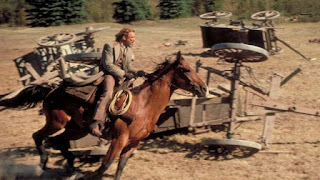 The closing of the frontier appears in The Wild Bunch (1969), for instance, and is associated with the dawn of a new, technological age represented by automobiles, machine guns, and German military advisors. Ironically, the giant roller skating rink that supplies Heaven’s Gate with its title is a symbol of the closing of the frontier, since its financial existence is premised on large numbers of customers, or, in this case, settlers. The film’s title is thus ironic, irony being a standard feature of many late sixties and seventies films of the Left and Right cycle. The film’s concluding sequence, showing James Averill having returned East, implies the West has run out of room. A final point. The film’s problematic hero reveals how Heaven’s Gate is unlike a standard Left movie, for by refusing to glorify its hero (violence does not lead to regeneration), it reveals his individualism as woefully obsolete. He seems overwhelmed by the complexity of the emerging modern world, fails to protect his friends, and inevitably succumbs to the inexorable forces of modernity.